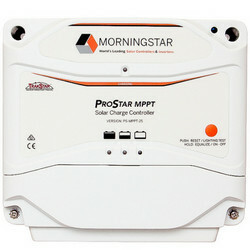 The ProStar MPPT™ is a mid-range MPPT solar charge controller with TrakStar Technology™ that provides maximum power point tracking (MPPT) battery charging for off-grid photovoltaic (PV) systems up to 1100 watts. Available with and without advanced built-in meter. This device is ideal for industrial and residential applications. A Wire Box accessory to reduce hazards associated with exposed wires and connections can be purchased separately.